I highly recommend the blouses with the big bow ties. The fuchsia is a knockout, and I love the retro-cool mix of prints on the other blouses. I'm also very nostalgic for the dresses. 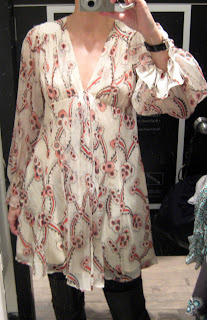 Spirited, feminine, well cut and so for a 20's-something hippie chick. Or those of us who fondly remember our carefree grunge years (ah, mosh pits, crowd surfing, and plaid shirts over Contempo Casuals dresses, does it get any better?). 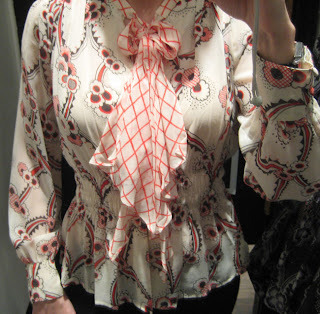 In my book, a print blouse belongs in every closet, and we all love bows these days, right? So what's not to love? The price; I do wish it was lower. 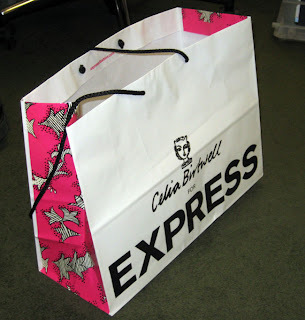 Will Express have a hard time moving these now that the recession has come out of the closet? 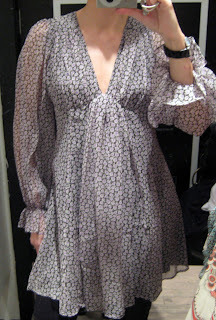 I hope so, as I'd like to pick up one on sale and not for $79.50 (blouse), nor $129.50 (dress). But we all know Celia's collection sold out in a morning at Topshop in London, so wait at your own risk. Express, Manhattan Mall level 1, 33rd & 6th Ave.
No-No or Yes-Yes: twin dressing?